Businesses of every shape and size, whether they sell to consumers (B2C) or other businesses (B2B), understand that traditional marketing tactics just aren't effective anymore. Small shops are ditching the expensive newspaper and radio ads in favor of a more effective (and measurable) Facebook presence. B2B companies are abondoning their annual trade show in favor of inbound marketing campaigns that deliver leads all year instead of just one week. At the end of the day, all businesses want to use their website to increase sales. If you want to Increase B2B sales with your website, it may at first seem tricky because you aren't able to make sales directly online. Luckily, with inbound marketing you can certainly start the process online and close deals in your normal sales process. 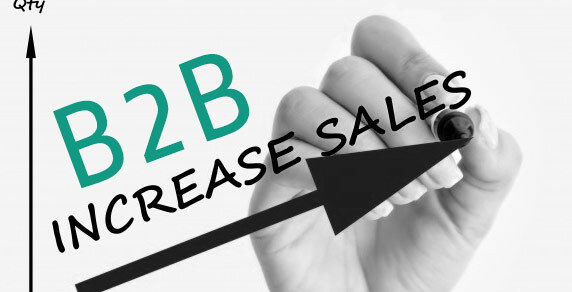 How do all B2B sales start? With a lead. It doesn't matter if it's a referral, an existing client, a website contact, or an RFQ. These are all leads. While the quality of each lead type will vary, they are all leads. If you want to increase B2B sales with your website, you must first increase the number of leads you're generating through your website. This means several factors need addressed. If you want more leads through your website, you'll likely need more visitors and better visitors. The latter is too frequently skipped over by companies and SEO providers. Lead generation will be much more effective with 1000 high quality visitors per month than it will with 3000 low quality visitors. So what is a high quality visitor? These are visitors that are looking for what you offer or are asking the questions you can answer online. If your site shows up for them when they do a search and they don't find what they were expecting, they will bounce, which means hit the back button and leave. That is a low quality visit. We want visitors that find your site and stick around because it's educating them and delivering content they were expecting. We want these visitors in as high of volume as possible. This is where so many B2B companies fail with online lead generation. They make the mistake of thinking they JUST need more traffic. That's not at all the case. In order to generate leads through your website, you have to have a better handle on how today's buyers buy. Not just end consumers, but B2B buyers. Think of your own shopping pattern for anything. Service, product, small items, big ticket items... it doesn't matter what. Nine times out of ten, you do your homework. The internet has made that process so easy. If you think that doesn't apply to your B2B business, wake up. It most certainly does. you can't rely on generating leads through your contact form! Your buyers will only fill out that form when they are ready to talk to a sales person. Today's buyer is anywhere from 60-90% of the way through their buying process before they will even consider using your contact form. This means you need to convert them into leads another way. A way that better fits with their research and buying process. This is most often through a high quality, educational content offer that will help answer your prospects' questions. This could be an ebook, infographic, webinar, sample request, etc... the primary differentiator between these offers and your contact form is that one is SUPER high comittment (the contact form), and one is educational and low comittment (content offer). BUT THEY BOTH YIELD A LEAD! Increasing B2B sales through your website starts with the lead, but you must also have a process in place to follow up with and nurture those leads if you want to close them into sales. Inbound marketing doesn't stop when the lead is created. Leads are further nurtured and followed up with until they are closed customers and raving, referring fans! We'll save the details of that topic for another post :). Your current approach is probably not working for B2B lead generation through your website. By driving high quality traffic to your site and converting them into leads with mechanisms other than your contact form, you will be well on your way to generating leads.